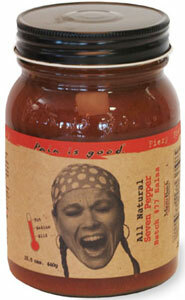 Pain Is Good Batch 77 Seven Pepper Salsa is a blend of vine-ripened tomatoes, fresh onions, cilantro and seven peppers: Green Jalapenos, Red Jalapenos, Roasted Green Chiles, Habanero Peppers, Birds Eye Peppers, Guajillo Peppers and the hottest pepper in the world…Ghost Chile Pepper. Please snack responsibly…you may want to keep a fire extinguisher handy. 15.5oz.